Meat hooks for ALL the survivors! 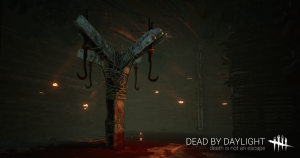 Dead By Daylight, developed by Behaviour Interactive and published on PS4 and XBox One by Starbreeze Studios, was a game that we first played at PAX East 2016. Charles and I both loved the genre, the gamplay, and atmosphere that was presented. When it first released it was only available on Steam, but starting this summer it will be available on Playstation 4 and Xbox One and will allow console gamers to have a “killer” good time as well. We were able to play the console version on the PS4 while we were at PAX and it did not disappoint. We were also able to speak with Behaviour Interactive’s Game Director, Mathieu Cote. Visually the game looks incredible. The lighting (or lack thereof) played well into the general fear that was pervasive to the atmosphere. The game is eerily quiet which accentuates the fear of silence as well as the sounds of death and terror. Mr. Cote described the lack of visual and audio settings in the game as integral to the way the game is played. If the graphics or volume settings were changed, the player would have an easier or harder time completing the objective, respectively. The gameplay consists of up to 5 survivors against one single killer. Survivors must repair generators spread across the level while the killer attempts to hunt them down and sacrifice their body on a meat hook. 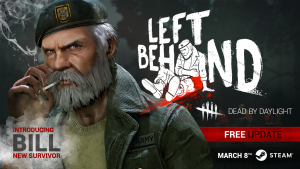 Players can choose from 8 different survivors, including one that will be familiar and exciting for many horror gaming fans out there, William “Bill” Overbeck from the Left 4 Dead series (which was given to players via free DLC on March 8). As gamers “We were so excited about Left 4 Dead”, says Cote. Players who get the distinct honor of playing as the killer will be able to choose from 6 different killers, including horror icon Michael Myers. Cote also mentioned that they could have filled Dead By Daylight with many different horror licensed characters, “but we don’t want to. We want to make sure it’s our own, we don’t want to dilute it. That’s why the first license we had in there was Halloween. ” He went on to say that “If we are going to go for a slasher movie, let’s get the bigger one. Let’s get the biggest one out there…Michael is the original slasher.” When Behaviour released their second DLC, Of Flesh and Mud, which consisted of all of their own material “it was just as well received.” This is a huge accomplishment and shows that their own stories and characters are getting players excited. Mr. Cote told us that players can look forward to a new chapter that will be releasing soon that they are very excited about. Unfortunately there were no further details about this new content, but we were assured that new killers and survivors are releasing soon and will be constantly updated. I was glad to hear that the studio is dedicated to keeping the game fresh for new and old players alike. Mr. Cote also discussed a “tournament mode” that will keep one open seat during a game for a spectator/announcer for better streaming capabilities. The tournament mode allows for much more player creativity and openness to the DBD community. I was able to play as the killer known as “The Hillbilly” which has a chainsaw power that must be charged and allows the killer to bolt forward and perform an attack on a survivor. He also had a secondary sledgehammer weapon for quicker attacks. I enjoyed at times seeing a survivor and just sitting back, watching them and predicting their next movements. It seemed extremely creepy to me, even though I was the one murdering everyone. The controls seemed natural on the DualShock 4 and should be really easy for players to jump right into the console version. I was on a high by the end because I had successfully sacrificed all of the survivors and didn’t allow any of them to escape. I will surely be playing Dead By Daylight on Playstation 4 when it releases this summer. “Bill” from Left 4 Dead is now a playable survivor through free DLC ! Thank you to Starbreeze Studios, Behaviour Interactive, and Mathieu Cote for taking the time to speak with us and let us play their games!